US stocks are in one of the longest bull markets in history. Many are warning of extended market valuations. Two of the most highly regarded valuation measures seem to agree. 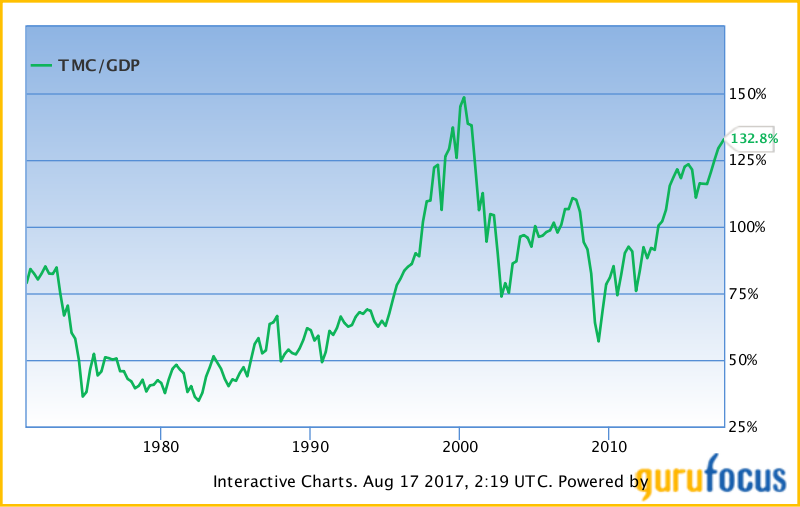 The chart below shows Dr. Robert Shiller’s CAPE ratio has reached levels surpassed only by the dot-com bubble peak in 2000. Likewise, Warren Buffet’s alleged favorite market measure, Market Cap to GDP, also suggests elevated valuations — shown in the chart below. From the 2009 bottom, the market rally is now more than eight years old and over twice the age of the average US bull market (48 months). Combined these seem like legitimate reasons for concern. But as the saying goes, bull markets don’t die of old age. Here are a couple less popular bits of market trivia to consider. The longest US bull market on record was over 15 years and stretched across three decades (the 1940s to 1960s). Of the last three bull markets, two lasted close to 13 years (the 1970s to 1980s and 1990s to 2000s). Some think this bull market will be the longest in history. That’s congruent with how the current economic expansion is one of the slowest in history. It makes sense that a slower expansion would take longer to expand. If this really does set a new record in length, that means we’re only halfway through this run. I don’t know when the bull market will end. But I do know markets can go for longer and farther than people expect. That’s true in both directions and my guess is the next bear market comes when least expected, is more ferocious than most are prepared for, and lingers for longer than many can remain solvent. The point is this is no market for old men. Investing everything into an S&P 500 index fund and then ignoring it can work, but today that approach will probably need much patience — like undisturbed for 20 to 30 years patience. And even then, there are likely better choices since US equity valuations do indeed look high.